​This section deals with the Croft Family in Aysgarth, and the emigration of several members of the family to America. Since publishing this website, I have been contacted by numerous descendants of the various branches of the Croft family, including several from America. One branch which seems to have flourished and spread to several areas of the USA is descended from James Croft and his wife Margaret (Temple). James Croft married Margaret Temple in 1751. It's unusual, but the marriage actually appears twice, once in the Aysgarth parish register (Margaret's home village) and also in the Arkengarthdale parish register on the same day! ​I think it's a safe assumption that James was from Arkengarthdale, one of three brothers, as in the register there are baptisms for the children of Thomas Croft and his wife Elizabeth from 1743 to 1757, and also baptisms for the children of John Croft and his wife Mary from 1760 to 1776. So James marrying in 1751 would fit perfectly between these two as the middle brother. The origin of these three is a mystery though. The Arkengarthdale parish registers begin in 1659, but there are no Crofts in them before the first baptism of Thomas and Elizabeth's son in 1743. There are then regular entries after this, baptisms, burials and marriages. It would seem therefore that these Crofts arrived in Arkengarthdale around 1743. Elder brother Thomas was already married as there is no marriage record for him in Arkengarthdale, the records commencing with the baptism of his children. I can find no record of either the marriage of Thomas Croft (his wife was Elizabeth, as we know from the burial record in 1771) or for the baptisms of any of the three brothers, Thomas, James or John. They would all have been born around 1720 - 1730, but I cannot find them anywhere! Following the families forward gives us more information. 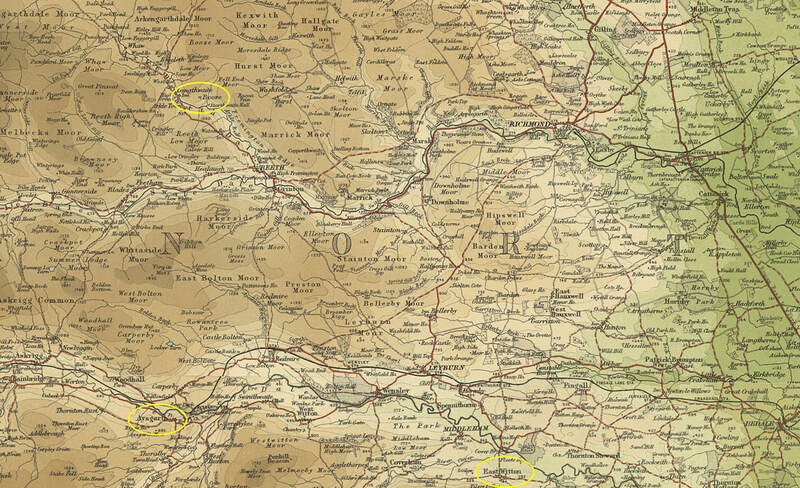 From 1810, the parish records also show the place of residence, and it seems that they were all living in the village of Booze (shown on the above map) in the south of Arkengarthdale. This was predominantly a lead mining area, and sure enough, when the records also begin to list occupations, they are all miners. James was the only one of this branch of the Crofts not to remain up in Arkengarthdale, but instead relocated to Aysgarth, the home village of his wife, Margaret Temple. They had a family of 3 boys and 2 girls - Margaret, James, George, Hannah and Michael. Their eldest son, James (b.1757), married Elizabeth Hutchinson in 1786 at Spennithorne (about 2 miles from East Witton), so it could well be that he was living and working in East Witton at this time. James was a stone mason by trade and it is likely that he played some part in the building of the new church at East Witton (completed in 1809), as well as the new houses around the green (built around the same time). However, all their eight children were baptised at Aysgarth (1786 to 1809), so it seems they lived in Aysgarth following the marriage. James's brother, George, died quite young, at the age of 20, while James's other brother, Michael, (b.1767) married Eleanor Spensely in 1794 and had a family of nine children, 7 girls and 2 boys. (although only 4 of the girls and 1 of the boys survived to adulthood). They lived in the village of Carperby, about a mile out of Aysgarth. He too was a stone mason by trade, as was his only surviving son, James, when he grew up. Michael married Elizabeth Holmes in 1810 and a family of 11 children. He lived in Carperby, near his uncle Michael, and was also a stone mason. Margaret did not marry, though she did have two children (fathers unknown) in 1814 and 1823. She too lived in Carperby. In 1817, James and Elizabeth emigrated to Fairfield, Vermont, USA. With them went their son Joseph (and his wife Nancy Carter), daughter Ellen (and her husband Thomas Bell), son James and daughters Sarah and Elizabeth. James purchased land in 1821, subsequently selling this land in 1829 to his son-in-law, Thomas Bell, after which he moved to Bucks Co., Pennsylvania to be with son James. Elizabeth (Hutchinson) died 1838 and is buried in Vermont. When and where James died is unknown, perhaps he remained in Pennsylvania, or perhaps moved back to Vermont before he died. Since his wife Elizabeth is buried in Fairfield, it seems likely that James also ended up there, though there is no record of his death or burial. It is possible that both he and Elizabeth travelled to Pennsylvania in 1829 and James died there, leaving Elizabeth widowed, and she then decided to return to Fairfield to be with the rest of the family. Joseph (b.1788) married Nancy Carter in 1810 in Aysgarth, England and had 2 children by the time of emigration in 1817. For health reasons, so the story goes, their eldest child, James (1810-1859) stayed with his Carter grandparents and did not travel to America with his parents, though 3 year old daughter Elizabeth did make the voyage. Joseph purchased land in Fairfield in 1819 and his and Nancy's descendants stayed in Vermont for several generations. Joseph died in 1868 and is buried in Fairfield. His wife Nancy predeceased him in 1852. Elizabeth (b.1814 Aysgarth, England) - married Yewell Coburn in 1832 and had five children. She died in 1878 in Fairfield. Joseph Benjamin (b.1825) - He was a farmer, and married first Pamelia Buck in 1844, with whom he had seven children. After her death in 1877, Joseph remarried, to Lydia Adelaide (Woodward) Johnson in 1878. They had one child together. Joseph's children all remained in Vermont, except for one daughter, (Estella), who moved to New Hampshire with her husband. Subsequent generations would spread further, including more to New Hampshire. John Wesley (b.1829) - He married Mary Northrop and had one son, Albert, born in 1857. He was a stone mason by trade, just like the family back in Yorkshire, England. He enlisted in the Union Army on 26 November 1861, and died of Typhoid 5 August 1862. Ellen (b.1797) married Thomas Bell in Aysgarth (1815) and emigrated to Canada first, subsequently moving to Vermont. Thomas purchased his father in law's (James) land in Fairfield in 1829. 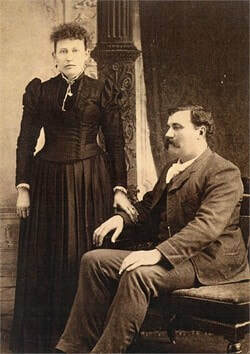 Thomas and Ellen had one child, also called Thomas, born in 1821 in Canada who became a blacksmith when he grew up. Ellen died in 1843 in Fairfield. Sarah (b.1805) may have married Isaac Staniford in 1827 in Vermont. Elizabeth (b.1809) married Andrew Breckenridge in Fairfield about 1827 and had 7 children: Elizabeth, Sarah (died age 3), Jane, Isabella, Ellen, Robert and Mary. They moved to Philadelphia, where Andrew subsequently died (year unknown, sometime between 1850 and 1860). Elizabeth remarried in 1860 to Samuel Steele, having no children with him. Elizabeth died in 1891. James (b.1799) married Lucretia, (surname unknown), in Fairfield in 1820, but she died one year later in childbirth. James's parents (James the elder and wife Elizabeth) kept the child for about 5 years while James (the younger) worked as a stone mason in Pennsylvania. He remarried in 1826 to Lavina States in Bucks County, Pennsylvania, and then 5 year old son (also called James) came to live with them. (this James left for the West on the Oregon Trail in 1852 at the age of 31, and was never heard from again, thought dead on the trail). James and Lavina had 9 children together, living on in Pennsylvania until 1834, then moving to Clinton County, Ohio until 1844 when they moved again to Marshall County, Illinois. James bought a sawmill on Sandy Creek, south of Magnolia Illinois, and for a short time he and his sons worked on the Central Illinois Railroad in order to earn the money to buy a farm. He then he reverted to his trade of stone masonry (the traditional family trade) which he remained with until his death in 1884. Lavinia lived another 15 years on their farm, dying in 1899. Their farm was inherited by their children, and was bought out by son, Marshall, who then contracted with nephew, Theodore "Dode" to run the farm. This nephew never paid on the note to his uncle and subsequently "Dode" willed the farm to his church, which Marshall sued in 1923, but lost. 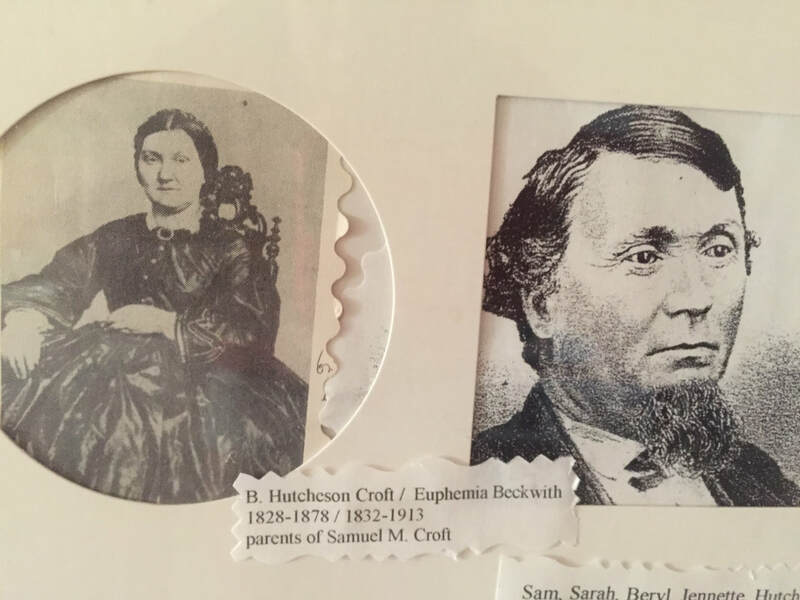 Their children of James and Lavinia were: Esther, Benjamin Hutchinson, Sarah Ann, Lucretia, Mary Louisa, Abraham, Ester Rebecca, Elizabeth Eleanor and Marshall. Two of these children, sons Benjamin Hutchinson (b.1828) and Abraham (b.1837), became successful highly cattle farmers in Illinois when they grew up, and Benjamin's son, Samuel Mortimer (b.1851), became first a butcher in Illinois, and then moved to Anthony, Kansas, where he bought a large farm and reared prize-winning Galloway cattle. Mr. Croft was of English parentage on his father's side, and was born in Bucks County, Pa. Sept. 7th. 1828. When about seven years old, his father moved to Clinton County, Ohio, and lived there until 1844. Hutchison showed when a small boy a strong inclination to deal in and handle stock, and for a boy his judgment was remarkably good, the faculty seeming inborn. In 1844 his father and family moved to the east end of Marshall County, Young Croft was then about 16 years old. They first lived in Evans Township, but afterward located in Roberts. The family was poor, and when he arrived at the age of manhood he had nothing to begin life with, and a poor education; but good judgment and an indomitable will enabled him to contend successfully with the disadvantages of poverty. When about 21 years old, he married Miss Euphemia Beckwith Dec 22, 1849. They went to housekeeping in the old log cabin on the Beckwith farm, where his wife had been raised from infancy. He first took a lease on the widow's dower in the farm, and after accumulating some property he bought the heirs out, and finally acquired full possession of the farm. This place seemed to be headquarters for all his trading operations. 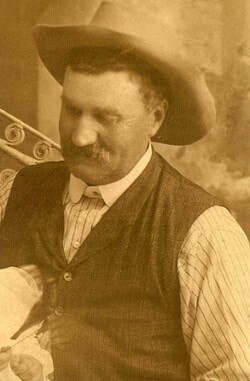 After he had been in business a few years, farming and raising stock, he went in partnership with John A. McCall and David Adams in buying and shipping stock to Chicago. Mr. Croft perhaps bought and shipped more stock to Chicago than any other man in this part of the state, as the firm always relied on his superior judgment. In after years, when business accumulated to such an extent that it was necessary to establish a bank, the firm established the old bank of J. A. McCall & Co., which did a safe business as long as Mr. Croft remained one of the firm. He accumulated wealth and bought farm after farm until at his death he had the Dent, Beepelle, Lloyd, Phillip, and the McCall farms, near Magnolia, in all 1,200 or 1,400 acres of valuable land. Of his children, Samuel, the oldest son, married a daughter of Peter Forbes, and lives on the Beepelle farm; Mary Lovina died Sept. 1st, 1861, and was buried in Cumberland cemetery; Emma married John Kirkpatrick and is still living on the farm; Julia lately married Clark Sinclair and is also living on the farm; James, the youngest son lives with Samuel. After Mr. Croft had accumulated a handsome property and in the prime of life, he was taken down with the spinal disease which rendered him helpless and a great sufferer. He was first taken down in June, 1874 and became paralysed below his vital parts. He had a stretcher constructed, covered with an air bed and mounted on a wagon, and with a driver he travelled in this conveyance about the country, buying stock and doing considerable trading. After he became an invalid he sold out all interest in the bank and dissolved his long-existing partnership with Messrs. McCall and Adams. His friendship grew stronger for his neighbors, and under the ministrations of Rev. Robert Taylor, a Cumberland Presbyterian minister, he attached himself to that Church, receiving the rites at his own home. He attended services in his invalid wagon, which he would have hauled up to the Church window, where he could see and hear the preacher. A short time before he died he sent for his old friend Thomas Judd and had him draw up his last will and testament dividing his property between his wife and children to the satisfaction of all. He died March 7th, 1878. His remains were enclosed in a metallic case and buried in Cumberland cemetery, on Sandy, where a splendid monument stands to mark the last resting place of a good man.